Double-sided, 4'' x 4'' cards. How to play. Players work together to create wheels of numbers that share a common factor. Can be used as an individual or group activity. Cards have a self-check feature (answer on back) to allow students to practice or review multiplication facts without supervision. For more activities, go to our "Teacher's Tools" section. The numbers in the factor wheel below have a common factor of 6. Players can continue placing more cards around the edges to make more wheels. Remember, if the numbers are touching, they must have a common factor. 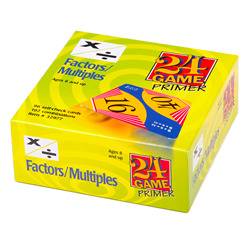 Use any card with the same common factor, regardless of the color in the corner.